Harry Chapman was born in Rochford on the 5th January 1878 to parents Henry, a farm labourer and Sarah, a laundress and lived at Rochford Hall Cottages. He had 3 brothers and 5 sisters. His father died when Harry was young and the family moved to Weir Pond Road and at the age of 13 he was working as a baker’s boy to help support the family. Later he worked as a carpenter and then as a clerk of building works for the Southend Education Department before he retired aged 67 just after WWII. He first played for Rankin’s Cricket Club (or Rochford CC as it was then) in 1900. He is in the earliest team photograph of 1908 (please see article Rankin's the Early Years) and continued to play until 1923. Harry was one of the founders of the Rochford Fire Brigade and at the age of 30 became its captain. After fighting a major fire in North Street he received a summons from Rochford Rural Council for the theft of the 3,000 gallons of water used to fight the fire, as the brigade had used a council owned stand-pipe. The issue caused uproar among the locals and eventually the case against Harry and his team was dismissed. He was called up for duty in World War I in December 1916 at the age of 38 and attained the rank of Corporal Mechanic in the fledgling Royal Flying Corps which became the RAF in 1918. 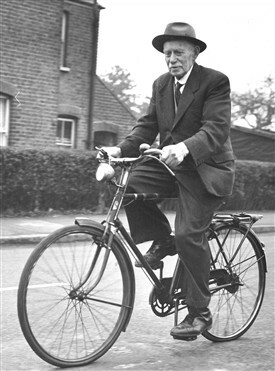 In later life he lived in Stambridge Road for many years and cycled everywhere. Dave Kennedy recalls him cycling to Broomhills Meadow to watch Rankin’s play cricket in the early 1970’s when he was in his 90’s. He continued to stay very active and lived to see his 100th birthday when the club members presented him with a cricket bat signed by the players, to commemorate the occasion and his long association with the club. The picture above appeared in the Evening Echo showing Harry at home with his signed bat. Sadly Harry died at the end of 1978. Harry was survived by his daughter Nellie, but the club lost track of the family so if anyone knows of their whereabouts we would love to make contact with them and learn more about one of our longest lived players. This page was added by Brian Pettitt on 18/08/2017.